Mina Cheon, Professor at Maryland Institute College of Art, is an artist working cross-culturally between South Korea, North Korea and the United States. In Dizz/placement: Half Moon Eyes, Mina explores cross cultural inter-perception of female beauty. As self-image fails to be reified into key models(or stereotypes) she uncovers value contradictions between North America, South Korea and North Korea. In her presentation, Video clips of surgery to the eyes to achieve the half moon effect are projected along with collaged images of cheerleaders and sirens and a touch-screen form of a virtual ballot booth. The panel, made entirely of artist/educator/mothers was diverse in it’s forms, Lisa Kaftori and Joan Giroux both covered an art of earth and ecology which promotes international community of understanding and an interdisciplinary collabroration in their specific art works. When the panel was finished information, ideas and inspiration swirled in the room, I felt lucky to have attended this diverse and empowering group of woman educators and artists. College Art Association 95th Extravaganza took place in Manhattan at the Hilton February 14 –17th. I had the privilege of organizing as both artist organized Press and working artist, not affiliated to academia, as are most of my colleagues, but paradoxically planning to cover the event for Artist Organized Art. Having found it inspiring, here’s a report made by contrast to cultural and political unresolved conflicts resigned to televised news. 2007, Hannah Higgins, Professor at The University of Illinois, Chicago was part of a panel discussion. Titled Inter-Classrooms: Interdisciplinary, Multi-departmental, Inter-institutional Art History Projects. To bring the interdisciplinary, interclass room and Intermedia to the institution requires pioneering approaches to education which certain elite art historians are re-discovering to legitimate and effective pedagogy adjunct traditional methods. Hannah Higgins offers a matriculated course on multi-sensory informatics using Fluxus as a central study along with her colleague Professor Simon Anderson. She uses concrete reconstruction of Happenings and events from Allan Kaprow to George Brecht as a gateway into a new information architecture modeled on immersive experience itself. Ms. Higgins detailed a reconstruction of the “No Smoking” event by Brecht paralleled by the passing of Chicago’s historic ban on smoking in public. As her students held up their Brecht event “No Smoking” signs, cars passed blowing their horns generating a sonic performance coincidence . . . an experience one could only have in the moment by being there. Hannah Higgins happens to be my sister, her contributions to our thinking pool are ones I’ve always admired, we need more education that re-informs our experience of life. 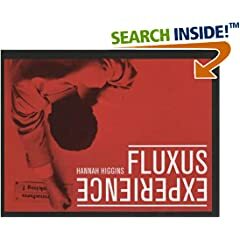 You can read her well thought out account of Fluxus in her Book, The Fluxus Experience. Hannah says her next book will construct, deconstruct and examine thoroughly the grid and it’s uses through out history, nature and predictions for the future, a potential for a ground breaking work. More about CAA to come. I’ll be covering Mina Cheon.